One solid piece of virtually unbreakable, undetectable personal protective material. Made completely of high grade plastic, this non-metal knife stretches 7 in. overall. Lightweight and discreet. Cool idea...would be suitable for self defense (even if dulled it could have a similar effect to a kubaton in the right hands I would think) but not as sturdy as I expected. The tip bent when I tested it on some card board. The photo of the guy hammering it into wood is absurd to me. Still for the money...not bad. This composite knife is flat on one side, so it occurs to me to buy another and epoxy them together for a hefty off-the-radar weapon. Doubling the thickness and features would make it much more functional than the cake-cutter it's sold as. Have also found it to be an excellent emergency back-scratcher. (bachelor thing). This plastic knife is a great defense weapon and that is what I bought it for. Great little defense tool. Sewed mine into a boot. 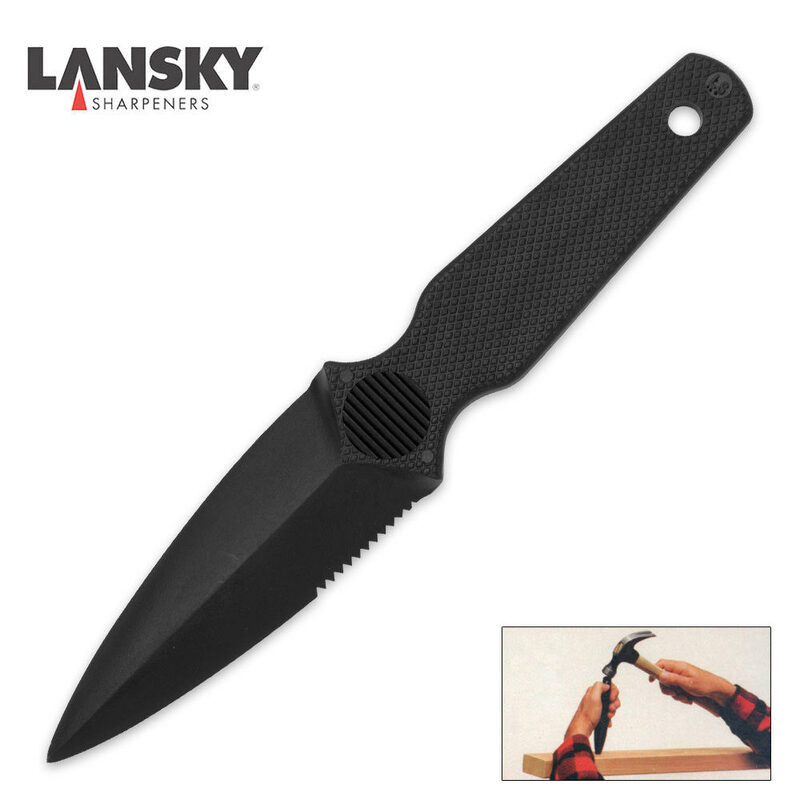 The Lansky is a hard plastic knife that would not be your choice for slicing apples or as a utility knife. 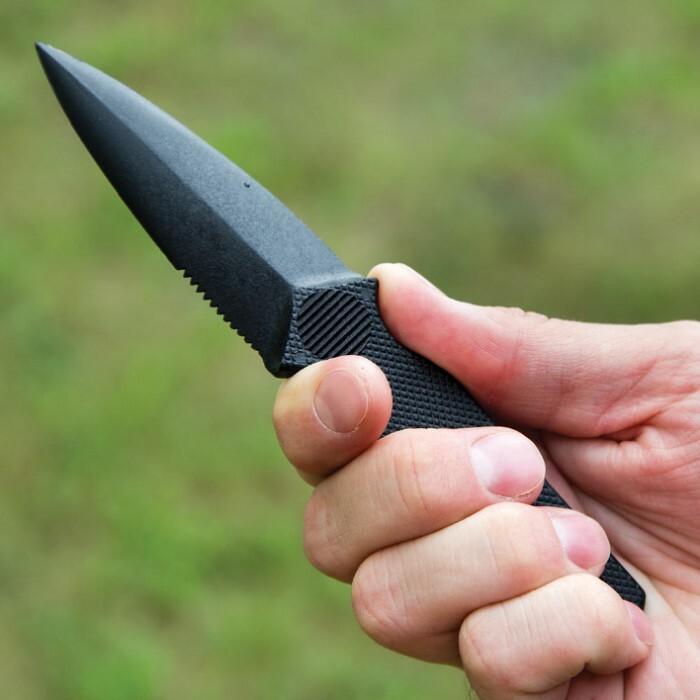 It does fit the bill as a hide-away knife that could be invaluable in certain situations. It is flat on one side due to it being a knife from a mold. Good knife as a hide in your jacket or pocket without being detected by the metal detector. Probably use is limited to that of a dagger. You won't break it using it as its intended but given some imagination you'll find a way. This is extremely lightweight, a couple ounces at most, chisel ground and fits in your hand. I was disappointed at first, but then remembered the price. The display picture is probably exaggerating a little bit, this knife doesn't seem indestructible, but within reasonable use for even a normal knife, I don't see any problems. Except the blade will most likely not hold much of an edge, certainly not if it's seeing use. Great knife, its acually an amazing throwing knife, better than most 5-10 dollar ones on true swords.